Born December 31, 1973 in Calgary, Alberta, it was in Bahamas’ clear blue salt-waters that Curtis first discovered his love for the sport. At age 7, following his father’s transfer back to Canada, Curtis joined Calgary’s Cascade Swim Club. At 16, he joined the University of Calgary Swim Club to be coached by International Swimming Hall of Fame inductee Deryk Snelling. “His work ethic and professionalism have always reflected positively on the team”, stated Dave Johnson, former Swimming Canada’ Head Coach. Curtis spent 12 years on the National team but first emerged on the international scene in 1990, qualifying in the 400 IM for the World Aquatic Championships. His first Olympic experience was at the 1992 Games in Barcelona at age 19. He finished 10th in the 400 IM and 25th in the 100m breast. Witnessing Mark Tewksbury’s gold medal performance inspired Curtis and directed him in the right path towards glory. He pursued his Olympic journey winning 2 bronze medals at the 1996 Atlanta Olympic Games in 200 and 400 IM and another bronze at the 2000 Sydney Olympic Games in the 400 IM where he also set a new Commonwealth record (4:15.33) . He was 6th at the 200 IM that year. 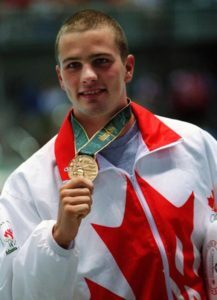 Curtis is remembered as the first Canadian swimming Olympian to win medals in consecutive Games (1996 and 2000), a Commonwealth record holder in the 400 IM (2000 Olympics), a 30 time National champion and as the Canadian record holder in both short and long course 200 and 400 IM’s. He was named Swimming Canada’s Male Athlete of the Year in 1994-1997, 1999 and 2000. He was also the 1996 recipient of the Howard Mackie Award, CIAU Athlete of the year and 4-time CIAU Academic All-Canadian Athlete. Curtis decided to pass on the 1998 Commonwealth Games to concentrate on his Bachelor of Science degree from the Faculty of Kinesiology at the University of Calgary. He graduated in 1999 with a specialization in exercise and health physiology. He became a spokesperson for the Paralympic Games and Operation Red Nose in Calgary. Moments after the official announcement of his retirement, Curtis became the first ever inductee into the newly created Swimming Canada Circle of Excellence in 2002.